On the 11th of November 2014 the 9th trendtalk will take place at the Inner City Ideas Cartel Auditorium in Cape Town, hosted by Plascon and Inhouse Brand Architects. Previous trendtalks have given numerous well-known industry professionals in the décor, media, design and retail industries a platform to share their first-hand trend insights. This trendtalk promises yet another prolific line-up: Southern Guild founder Trevyn McGowan, John Sanei of Future Collective and trendtalk founder Lauren Shantall will all be presenting. These industry shakers and shifters will be sharing visuals, provocative ideas and thoughts on lifestyle changes in line with the talk’s “Looking Ahead to 2015” theme. 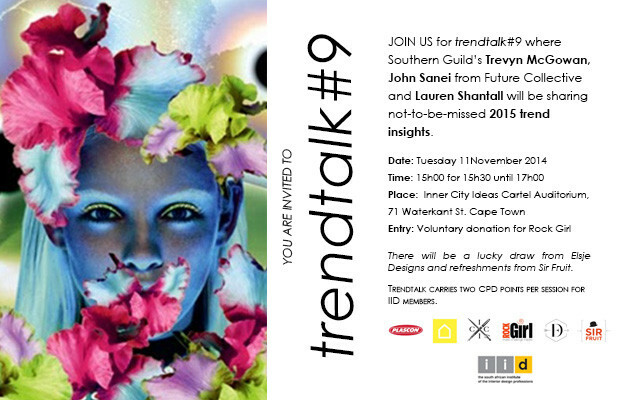 trendtalk#9 is open to all interested parties at no cost and will run from 15h30 to 17h00. The event, co-hosted by Plascon and Inhouse Brand Architects, is in aid of design charity, Rock Girl. There is a voluntary donation at the door and all proceeds will go directly to Rock Girl. Guests can look forward to a give-away from Elsje Designs and beverages supplied by Sir Fruit. Seating is “first come, first served”, so guests are advised to come early to secure a seat. Trevyn McGowan has been a key figure in taking design forward in South Africa over the past 10 years. After running her own interior design company, Site Specific, for 9 years in London, Trevyn returned to South Africa where she and husband Julian McGowan, founded Source. Source is an agency responsible for exporting and promoting Southern African design to high-end international retailers. Together they also founded Southern Guild, the Southern Guild Foundation and run Design Network Africa. Southern Guild represents limited edition design by South African designers and artists at international design fairs. Design Network Africa exists to alleviate poverty through design entrepreneurship. This year they went on to launch GUILD, Africa’s first international design fair in Cape Town and the Business of Design conference. Trevyn is also the curator at the new Watershed project at the V&A Waterfront. 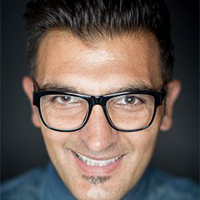 John Sanei is a dynamic thought leader in the field of trend analysis and business strategy. His entrepreneurial spirit and unique energy has taken him from distributing high-end fashion products to owning some of South Africa’s busiest restaurants. He is a sought after speaker and trusted advisor across many industries and his three-step program – Trenovate, Amplify and Share, forms the backbone of Future Collective, a company he co-founded in 2013. Future Collective is a pioneer in reprogramming businesses and brands, making sure they stay relevant, authentic and ahead of the curve in an ever-changing world. As the founder of trendtalk, Lauren is passionate about the relevance of trends. She is an award-winning journalist and has been involved in the design industry for many years, from being Deputy Editor of Elle Decoration magazine to Editor of Design Indaba magazine, as well as managing The Design Indaba Expo. In 2010, Lauren launched the Freeworld Design Centre where she managed a team of decor stylists, consultants and interior designers and activated cultural events and exhibitions. 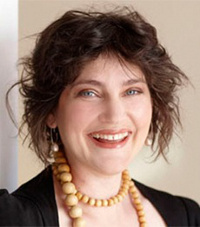 Currently, she runs her own marketing and communications company, Lauren Shantall (Pty) Ltd. Lauren is also a Director of the design charity Rock Girl (www.rockgirlsa.org) and sits on the content advisory committee of MODILA.